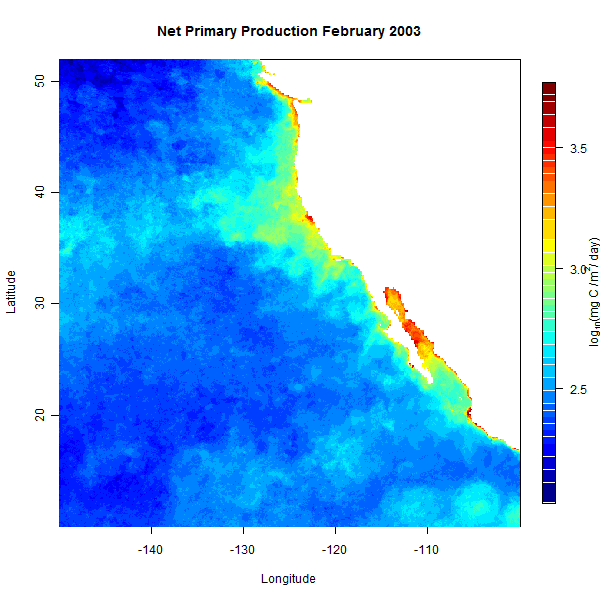 Oregon State University makes a set of ocean productivity data derived from satellite data available for download and use by researchers. 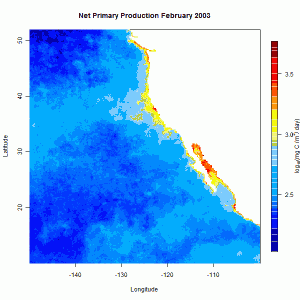 The Ocean Productivity website explains the available data and how it was derived. I have put together a few R functions to open a subset of the available data files and plot the data. Average monthly net primary productivity along the west coast of North America during February 2003. Data derived from OSU’s Vertically Generalized Production Model. The data files used here are from the Vertically Generalized Production Model (VGPM) based on Behrenfeld and Falkowski 1997. Most of the available files on the website are HDF5 format, which is currently difficult to deal with in the Windows version of R. The standard VGPM data derived from MODIS satellite data are also available in a simplified text file format (called .xyz files by OSU). These data files can be reached from this page. The functions below work on the .xyz file type. The .xyz files are available in two resolutions, one with 1/6-degree steps between grid cells (1080×2160 grid), and one with 1/12-degree steps (2160×4320 grid). The files should first be downloaded to your local machine. a raster image, which results in a smaller file size when saved as a pdf or when displayed on screen. On my machine, trying to plot data for the entire world as a vector graphic fails to display anything because of the large amount of memory necessary for such an operation, while displaying the same data in raster format works just fine. The raster display function is a bit of hack, as you’ll see if you check out the function code below. The functions below can be downloaded as a R script called OSU_VPGM_load_functions.R from my GitHub repository. Run that script in a R session to gain access to the functions. # files and plotting the data. See below for further information. # and the productivity value, in a simple text file format. # the center of each pixel is given. # the center of a grid cell. # See here: http://orca.science.oregonstate.edu/faq01.php for more info. #   Tools for spatial data. R package version 6.6.1. # productivity data from the specified region of interest. # changed to NA during the initial file read. # value. The process is the same for the higher-resolution 2160x4320 files. # latitude must be the northern-most edge of the region of interest. # be in the row/column names of the matrix, as produced by vgpm.load(). # latitudes order reversed so that they increase as you move across columns. # also optionally plots the data. # interest with lat/lon listed in the row and column names. # file sizes due to the large number of vectors used to make up the figure. # file size. For small areas this won't be as much of a problem. # useRaster = TRUE option of the image plotting tools. # aren't converted to exact 1/6° steps for latitude and longitude. # near the south pole. # data and lat/lon values extracted above. # Generate a new set of lats and longs on a regular grid spacing for plot.